"I swear it's a single dolphin." "Don't be stupid, they're rarely on their own." Two minutes later we frantically grabbed our snorkeling gear and sprinted (practically raced) down the beach and swam out to our boat anchored just off shore. The search was on! Unfortunately, we lost the rebel singleton. However, and it's a big however, within 10 minutes I spotted a pod, a huge pod of more than 30 dolphins. Maybe our rebel wasn't so brave after all! Without hesitation I sprang into the water and was closely followed by some excited friends. The dolphins however cruised past us with little interest and left us treading water in the notorious "Tiger spot"! We know big Tigers, Bulls, Great Hammerheads and Lemon sharks regularly patrol these waters and, although I'm a keen shark lover, I'm not entirely confident I'd have felt comfortable seeing an unexpected 4 m shadow lurking beneath me! So back on the boat we clambered, and within a few minutes we caught up with the pod. But this time we had a plan. We edged just ahead of them, I leapt in and started free-diving down; twisting, turning and making creative shapes with my body. Now I had their attention. Due to a dolphin's complex mind, social nature and advanced water skills, attracting and holding their attention in the wild is pretty challenging, to say the least! Interesting and engaging them is hard when you're considerably slower than them, you can't dive as deep and you don't have their impressive breath hold! Diving, turning, twisting, spinning, splashing, blowing bubbles, crazy yoga diving type moves, screaming and singing underwater.. anything went! We all did our best, they accepted our attempts and welcomed our presence. I had a few magical moments with an adult and calf. They paralleled me as I dived down, and circled me as I twisted and turned. I felt their curiosity and enjoyment as they mimicked my movements under the waves. It really was a special moment. I repeated the dive a few times ahead of them and -- yes, you guessed it -- they singled me out, approached me and copied my somewhat crazy underwater dance moves! We were truly blessed to swim with these dolphins for over 3 hours and the moment they stopped "playing" with us, we called it a day. As a group of passionate animal lovers we didn't touch or ride them, and we didn't overstay our welcome. I, like so many others have always wanted to swim with wild dolphins and have been fortunate enough to do so a few times around the world. 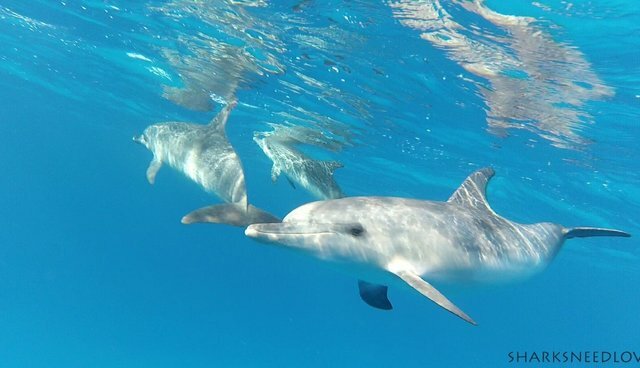 However, as us humans venture more and more into the sea we have an important role to play in protecting it so generations to come will also have the luxury of magical aquatic moments with wild sea life. Now I've always been a "water baby" and cared about our oceans however in the past few years I've been shocked to discover the reality of how humans are abusing what our oceans have to offer. Highly intelligent mammals such as dolphins and orcas held prisoned in captivity for our "entertainment," the destructive, inhumane and damaging large fishing boats armed with long liners, gill nets, purse seine nets and trawlers equipped to satisfy our growing greed for cheaper seafood. And let's not forget the heartbreaking creatures that lie floating victims of beach swimmer nets. Our undeserving sea life being treated as dispensable and ultimately their lives as inconsequential. The reality is masses of seafood consumers are turning a blind eye to what's really going on. For example: how many of you eat (and pay a premium for) "dolphin safe" or "dolphin-friendly" tuna for your tuna fish sandwiches? If so do you know why it's marketed and labelled that way? Is it a process used to reduce dolphin fatalities whilst fishing for tuna? Well, yes, yes it is -- BUT there's a much bigger picture and a high price to pay for other animals. You need all the facts to judge for yourself what you feel comfortable accepting and what allows you to eat your delicious meal with a free conscious. Eating out? Consider, and ask (!) the species on the menu and the fishing technique used to catch your supper. Ideally they'll have little or no bycatch (i.e. animals captured that were not the intended target) helping to protect other sea life where possible. You'll never get the fine detail of boat landings or limitations, discards and whatnot. However, you can control what I believe is the most important part of the supply chain: demand. If they're serving something you don't feel comfortable admitting you're eating, say NO! Back to my point. The reality of "dolphin safe" tuna is that bycatch for this method of fishing is far greater than the old, original method of tracking dolphin pods. The fishing technique changed due to the public outcry that dolphins were being killed as bycatch while fisherman targeted tuna. Now roles have changed as most dolphins swim free while the new technique takes more victims than ever before. Boats operating a "dolphin safe" fishing policy use purse seine nets to capture tuna. Unfortunately they are indiscriminate and capture a HUGE variety of other sea life too, collectively known as bycatch. Bycatch includes but is not limited to: sharks, turtles, sailfish, many fish species, the odd dolphin and many additional sea creatures. Saving some of the world's dolphins is costing us a great deal more. Sharks. On average 100 million sharks are killed every year, that's a shocking average of over 274,000 sharks killed every day by humans. This is considerably unsustainable and is damaging the balance within our oceans ecosystems. The majority of sharks in this figure is due to demand for shark fin soup which is considered a delicacy in many countries but hugely proportioned to Hong Kong. Fins are taken from sharks targeted by fishing boats and sharks caught as bycatch. The "dolphin friendly" tuna contributes towards this outrageous death toll. Turtles. Although turtle eggs are still considered a delicacy to some the act of stealing eggs from a turtles nest is not only frowned upon by many but is now illegal in many countries. Turtles are hit hard by drifting nets such as ghost nets and swimmer nets and yes you guessed it, the nets used to capture the "dolphin friendly" tuna. Turtles are particularly vulnerable to netting methods as they need to reach the surface to breath, they wait trapped and entangled in nets hoping for a fisherman's haul to set them free. However, the reality it this rarely arrives in time. My point? The only way to eat seafood comfortably is to know HOW your dinner was caught and WHAT species you're about to snack on. Back to my example of a tuna sandwich. The best, most sustainable fishing method for tuna is pole and line caught tuna where they are directly targeted and bycatch, if any, is released almost immediately. Get to know the brands that offer sustainable methods of fishing and help protect both the dolphins and the multiple bycatch sea life that would otherwise die in most "dolphin friendly" tins of tuna. Stop demand and you'll stop destructive fishing processes. It's been done before. We can all make a difference but it's down to us as individuals to make the effort to do just that. Whether you're eating out or shopping in the local supermarket use Google to search your dinner choice, it's a powerful tool! 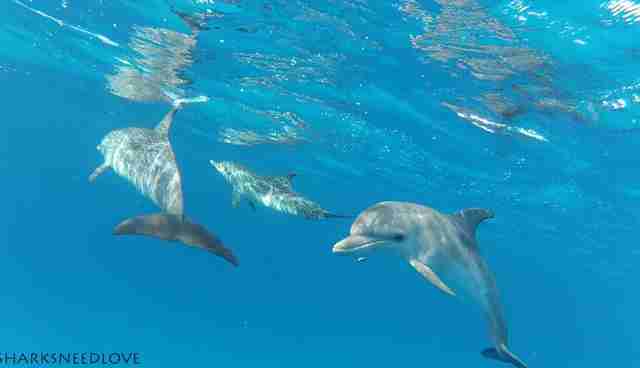 Swim with dolphins in the wild, say no to captivity and always eat sustainably.